This shop has been compensated by Collective Bias, Inc. and its advertiser. All opinions are mine alone. #ListerineBOLD #CollectiveBias I truly believe that the most amazing things in my life exist outside of my comfort zone, especially when it came to my athleticism. 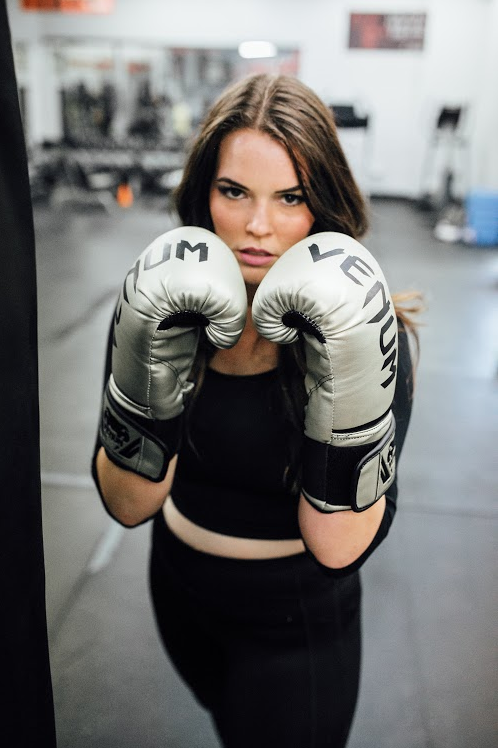 After pushing past some fears and feelings of unworthiness and inadequacy (that have always held me back in the past) I found myself in a boxing gym ready to make a big change. I wanted to feel differently about myself and have the confidence that I could do anything I set my mind to. Up until last year, I’d never considered myself active or fit and wouldn’t have ever believed that I would find my inner athlete and fall in love with boxing. After twelve months I’ve lost 65 lbs with great nutrition and boxing, but I’ve gained even more confidence in myself and for the first time in my life, I consider myself an athlete. I’ve grown and had so many empowering experiences that I wouldn’t have ever had just staying in my comfort zone. Now I like to box 5-6 days a week at the gym and have come up with a list of my personal gym etiquette, which is definitely worth noting if you’ve ever thought about working out at a fighters gym. But remember the NUMBER ONE rule of going to any gym (anywhere really) is to wear deodorant and have good smelling breath. In a boxing gym, you’re kind of up in everyone’s face and it’s not uncommon for your trainer to get in your “bubble” to give you help and boxing critiques (not to mention, all the other people to talk to while you’re there). I like using LISTERINE® COOL MINT® Antiseptic Mouthwash because it kills 99.9% of bad breath germs (including ones that lead to gum disease), reduces 52% more plaque than brushing and flossing alone and has 24-hour protection against germs. So I can feel confident talking to my trainers and other gym goers the whole time I’m there. I cannot stress this enough, but friends PLEASE make sure you aren’t showing up at the gym with fresh onions on your breath. It’s gross. So do what I do, and double up on your oral care. In addition to using LISTERINE® COOL MINT® Antiseptic Mouthwash, I also love keeping LISTERINE® POCKETPAKS® Cool Mint 72c in my gym bag because I can freshen my breath on the go, they dissolve in my mouth instantly so I’m able to have fresh breath and still wear my mouthguard during sparring. When your breath smells clean and fresh it gives you more confidence to talk to other people in the class. Also, remember to offer a sheet from your LISTERINE® POCKETPAKS® to anyone around you when you have one, it’s polite and sharing is caring. Because our gym mostly does scheduled classes, it’s VERY important to show up a little early so you can wrap your hands and get ready mentally. I know there are times when running late can’t be avoided, but if you can, make sure to get there 5-10 minutes early. Punctuality is respectful and you’ll be able to choose a spot up front, or wherever you’d like and you won’t feel rushed. You’ll also win brownie points with your trainer, and who couldn’t use more of those before you step in the ring together?! If you like what someone is wearing, see improvements in someone else’s technique/fitness journey or liked the way your trainer planned the workout, say so. Others will remember how you made them feel and everyone loves a genuine complement. Besides, it costs zero dollars to give them so if you have more give more. Also, get to know the people in your class. I know this is hard for some and it’s not for everyone… But remember that whole pep talk about growth and cool experiences that come with getting uncomfortable? I promise you’ll get to meet some of the coolest people and hear their stories by getting to know them. And it’s easy because if you go to the gym regularly, you’ll see them a lot. I personally love knowing people’s names so I can greet them using it. Having friends at the gym has been a HUGE way for me to gain motivation to keep going, especially on the days when I’m too busy or had a hard day and don’t feel like going. I don’t know about you, but I sweat SO, SO much when I’m boxing. It’s awesome to work your booty off and see a puddle underneath where you’re working, but it’s not awesome to share that stuff by not cleaning up after yourself. Always, always wipe off any equipment, mats, your heavy bag and anything else you use so it’s nice and clean for the next person. Break your goals into smaller/more attainable daily, weekly and monthly ones. Having a target to shoot at makes tracking progress easer and more effective Make sure you’re not only setting goals for your health and fitness journey, make sure you’re setting goals in nutrition and mental goals too. I’ve noticed that I can always hone in on one of these areas to make it more effective for myself. LISTERINE® COOL MINT® Antiseptic Mouthwash is the only nationally branded antimicrobial mouthwash to receive the ADA Seal of Acceptance for fighting plaque and gingivitis. LISTERINE® POCKETPAKS® COOL MINT® Kills 99.9% of bad breath germs and odor-causing bacteria in 30 seconds. Look for LISTERINE® COOL MINT® antiseptic mouthwash and the 72 count LISTERINE® POCKETPAKS® COOL MINT® at Walmart in the health and beauty section. Check here for money saving coupons and don’t forget to follow them on Facebook. What is your favorite way to fight bad breath at the gym? Thank you so much! It is hard but very addicting!